Rest in God | God's Abundant Blessings! There’s really not much more to say. Do you hurt? Are you scared? Do you have a need, a concern that is more than you can handle? Rest in the knowledge that God already knows all about your needs and He cares completely for you. Surrender your hearts to Him. Trust in Him. 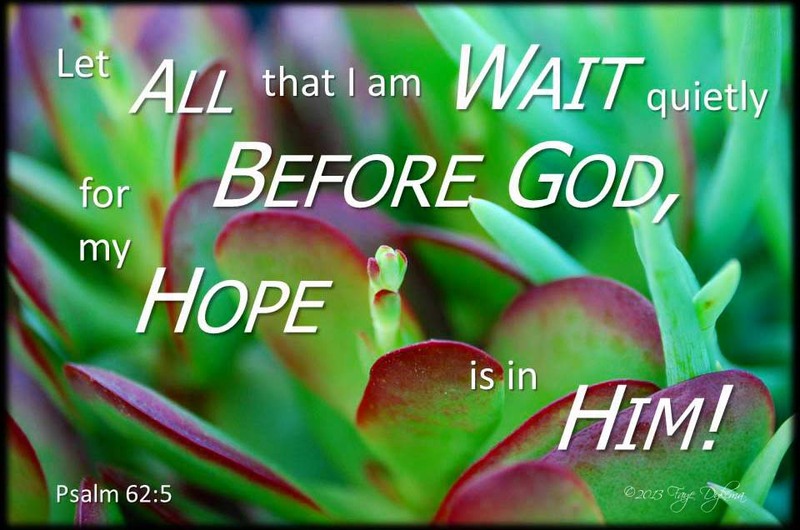 Wait on Him. I’ve said in previous posts that Psalm 62 especially verses 5-8 have really spoken to me in the past year. I have decided to take up memorizing these verses so I can meditate on them day and night. All my years growing up in Christian school I was required to memorized passages from the Bible. I have always visualized the layout of each sentence and that helped me to remember it. Recently, I thought about the photos I post here and realized I could make it visually stimulating to help me with the memorization and recall. One technique for deeper understanding of a Bible passage has been to read it over many times, each time emphasizing a different word. This has provided richer blessings as the meaning has soaked in from different perspectives. You may want to try that. Something else I noticed is that when I originally copied this to my mirror, to begin and end each day with this reminder, is I omitted the word quietly. I know it is supposed to be there but on different days I may change wait quietly to intentionally, patiently, joyfully, hopefully, excitedly, humbly … the list goes on. It has been a good reminder for me to be completely focused on how I see God and how I interact with Him. The next couple of posts will be from these verses. I hope you can enjoy time to meditate, memorize and be filled with God’s meaningful word.